When on February 18th 1943 Reich Minister of Propaganda Joseph Goebbels in a speech at the Berlin Sports Palace announced a "total war," the Scholl siblings distributed leaflets at Munich University calling for resistance. Shortly after that, they were arrested and later sentenced to death in a show trial. This year 2013 marks the 70th anniversary of their execution. The resistance movement called the "White Rose", whose members were Sophie and Hans Scholl and others . They were firstly die-hard supporters of the Hitler Youth and the League of German Girls, but later became resistance fighters against the regime of Adolf Hitler. This reflects the internal transformation presented in this exhibition "The Dream of the other Germany." 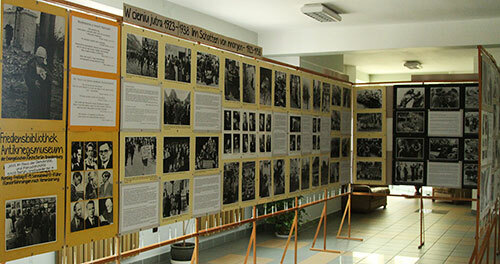 200 large-format black-and-white photos, show events of everyday life from 1923 to the end of the war. Photographs of inflation and unemployment before 1933 in Germany, Nazi demonstrations in the streets, the Olympic Games of 1936, concentration camps, the Warsaw Ghetto and Germany in ruins, are shown. Next to these photos are private photographs of Hans and Sophie Scholl, Willi Graf, Alexander Schmorell and Christoph Probst and 60 citations. Extensively documented at the exhibition are passages from leaflets of the resistance group, diaries and letters. The notes show the great humanity and the will to resist among the members of the "White Rose" during an inhumane time. Its aim is to show the spiritual background of the resistance movement. The reality of the recent history of WWII still appeals to our humanity, and calls us to stand against injustice and human rights violations. The exhibition was created by the Peace Library and of the Anti-War Museum of the Evangelical Church of Berlin-Brandenburg, Silesian Upper Lusatia, whose goal is to warn people of the danger of military conflicts and give examples for their peaceful resolution. The exhibition "The Dream of a different Germany" was founded in 1993 and has been shown already in 200 different cities, as well as in the German Bundestag.